Maybe it's not the time anymore storing gold at home or bank vault. Then, if you think to save them on a motorcycle? 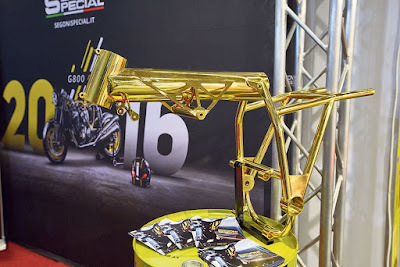 Perhaps the the Italian motorcycle home modifications, Segoni Special was the one that make it happen. Well, the Italian motorcycle home modifications renowned always produce something unique with high creativity and has been made since 1974. However the company also has a way of lifting the motorcycle look unique and deserved to show at the INTERMOT 2016 exhibition in Germany some time ago. 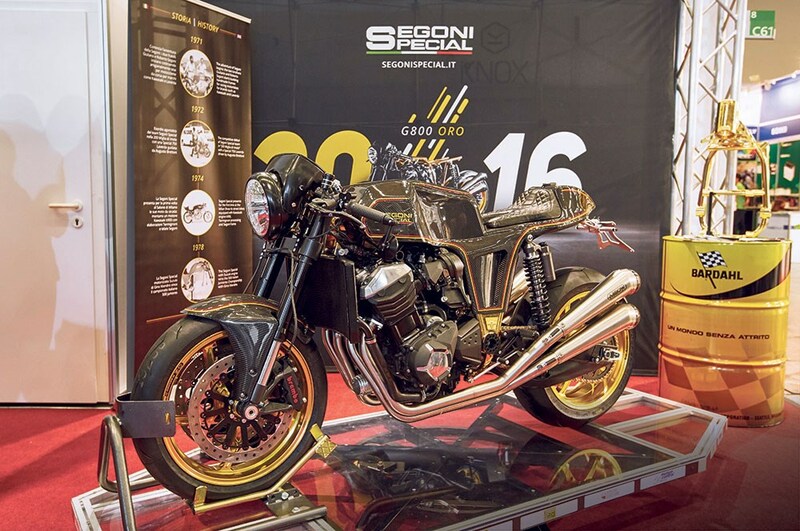 The Milan-based company create Segoni Special G800 Oro, where in Italy and Spain 'Oro' means "Gold", which is then translated by Segoni Special into a café racer styled motorcycle, and supported by 24-karat gold plated on its chrome molibdenum frame. Segoni Special G800 Oro powered by a Kawasaki Z800 engine, and equipped with OZ Racing wheels, Marzocchi forks, Brembo M4 brakes, aluminum tank, hand made swingarm, Arrow twin exhaust and Bitubo shock absorber, meaning this made-in-Milan machine is (nearly) an all-Italian affair. The machine is capable of producing a power of 113 hp and 83 Nm of torque. Enhance the motorcycle appearance, a carbon layer also covers the tail and some part of the gas tank. This gold plated café racer only made in limited numbers, ie 20 units and priced at €58,000 or equivalent to Rp.832 million.